Europe is Europe’s last remaining realistic political utopia. But Europe remains to be understood and conceptualized. This historically unique form of international community cannot be explained in terms of the traditional concepts of politics and the state, which remain trapped in the straightjacket of methodological nationalism. Thus, if we are to understand cosmopolitan Europe, we must radically rethink the conventional categories of social and political analysis. This book completes Ulrich Beck’s trilogy on ‘cosmopolitan realism’, the volumes of which complement each other and can be read independently. It is essential reading for anyone interested in the key social and political developments of our time. Chapter 1: Introduction: The European Malady and Why the Idea of a Cosmopolitan Europe Could Evolve. Chapter 2: The Reflexive Modernization of Europe. Chapter 3: The Cosmopolitan Empire: The State and Power in the Case of Europeanization. Chapter 4: Europe's Social Arena: On the Variable Dynamic of her Borders. Chapter 5: Strategies for the Cosmopolitanization of Europe. Chapter 6: Diversity and Acceptance: Pan-European Social Conflict and the Political Dynamic. Chapter 7: On the Dialectics of Globalization and Europeanization:Without Oppositions to a Cosmopolitan Europe. Chapter 8: A Cosmopolitan Vision for Europe. "An important stimulus to how Europeans can seek to understand critically what will happen to them in 2008 and beyond." "This is an important, highly relevant, and compelling book. It will be valuable to anyone who is interested in the present state and future of Europe." Brilliant new work by Ulrich Beck, one of the leading social thinkers of our time written with an eminent scholar of sociology. 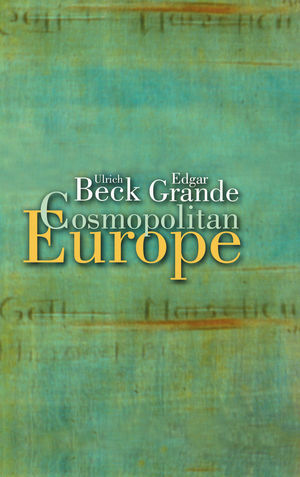 Beck develops his now classic concepts of second modernity, risk society and reflexive sociology into a radical new sociological analysis of the cosmopolitan implications of globalization in Europe. This book completes Ulrich Beck’s trilogy on ‘cosmopolitan realism', whose volumes complement each other and can be read independently. The Cosmopolitan Vision develops the theoretical perspective which in Power in the Global Age is applied to key issues concerning the postnational legitimation of political power and, finally, in Cosmopolitan Europe, is tested against a special case, the unknown Europe in which we live.